This stack is aimed for people who want to get a bit extra out of their workouts. It provides motivation for those few extra reps, and hopefully breaking your personal record. This stack is not meant for daily use, but a few times a week is no problem. Its peak effects last 3 – 4 hours, but you’ll feel awake and alert for an additional 4 hours. After the first 4 hours, another capsule of Noopept can be taken to extend the full effects. Caution with taking this stack in the evening, as it can affect your sleep! 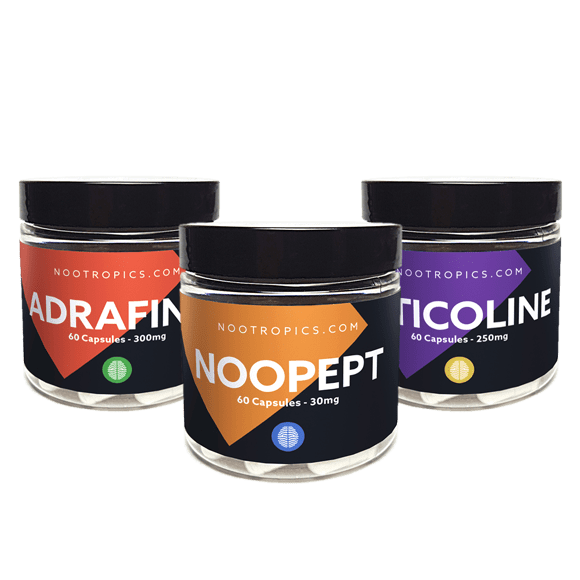 Noopept’s purpose in this stack is to increase your motivation and willpower, making it easier to get started on your workout but also to keep going a little longer. As an added bonus, it has neuroprotective benefits as well. Adrafinil is here for its wakefulness and energy effects. It creates a sharp focus and a strong presence of mind. Together with Noopept it can boost your motivation and energy, even when you get tired. Citicoline has modest benefits on its own, but in this stack it is meant to potentiate the Noopept. The latter interacts with the brain’s acetylcholine system, and taking Citicoline supports this. Citicoline also prevents the headache that can be brought on by Noopept’s interaction with the acetylcholine system. Capsules per day: 1 capsule each. After 4 hours, another capsule of Noopept can be taken for extended effects. Effect duration: Peak effects for 4 – 5 hours, with wakefulness and focus for 4 hours after that. After the first 4 hours another capsule of Noopept will extend the effects for another 4 hours. Residual effects can last up to 10 hours afterwards. Extended use: This stack is not meant for extended use, but can safely be taken every other day. After the first 4 hours, another capsule of Noopept can be taken to extend the effects for another 4 hours. Adrafinil may disrupt sleep, especially if taken later in the day. It is very important to drink more than your regular amount of water, to keep hydrated and prevent headaches. If you’re worried that you might be predisposed to depression, leave out the Citicoline until and unless you get a headache. Adrafinil can reduce the efficacy of hormonal birth control. Adrafinil and Noopept are both stimulants. Anyone with a predisposition for anxiety is advised to proceed carefully, as this stack may worsen their symptoms. Do not consume alcohol if you have taken Adrafinil or Noopept.